Christy Johnson is currently an independent curator, writer and part-time ceramics instructor. She holds a BA in English Literature from California State University, Los Angeles, and later studied ceramics at Pasadena City College with Phil Cornelius and at Otis College of Art and Design with Ralph Bacerra. 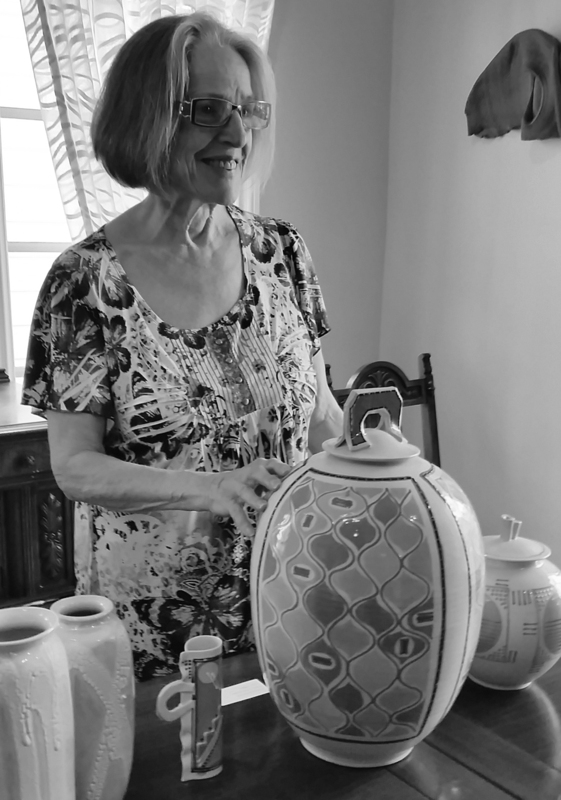 Her pottery career includes many exhibition credits, awards, teaching experiences, and workshop presentations. Time initiative, producing a critically acclaimed exhibition, Common Ground: Ceramics in Southern California 1945-1975, and book of the same title. Among her current curatorial projects are Otis Revisited and Crossroads in Clay at Chouinard and Otis: The Ralph Bacerra Years, two out of four Los Angeles year-end exhibitions associated with famed ceramic artist Ralph Bacerra. Clay Center, Minneapolis, MN; and a 45-year retrospective, A Potter's Menagerie, at the Arkansas Art Center, Little Rock. His works are in the collections of the Wiseman Museum of Art, Minneapolis, MN; the High Museum, Atlanta, GA; the Georgia Museum of Art, Athens GA; and the Renwick Gallery, Washington, DC. Montréal ceramist Léopold L. Foulem’s distinguished career extends over more than 30 years, with over 50 solo exhibitions and more than 200 group shows. Foulem taught ceramics for more than 20 years at the CÉGEP du Vieux-Montréal, and fine arts from 1994 until 2013 the CÉGEP de Saint-Laurent. He is also a world authority on Picasso's ceramics and has lectured extensively on the subject of ceramics as an autonomous art form; many were published. Foulem has said, "My ceramics are about art and ceramics, and ultimately about ceramics as art…I believe that genuine art is about concepts and indisputably neither about medium nor style, nor even about making." Jason Walker was born in 1973 and grew up in Pocatello, Idaho. 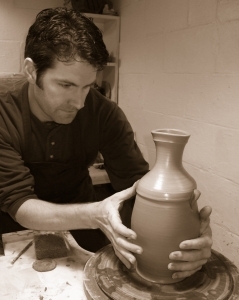 He received his BFA from Utah State University and his MFA from Penn State University. 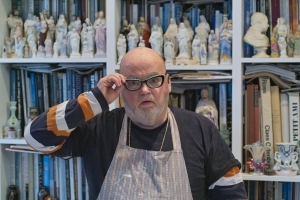 Walker spent two years as an Artist in Residence at The Archie Bray Foundation for the Ceramic Arts, where he was the recipient of the Taunt Fellowship award. He was also awarded an NCECA International Residency Fellowship for a residency in Vallauris, France. His work is included in major collections and he has shown and lectured internationally. Walker's ceramic art explores the complex and paradoxical relationship between American culture, technology, and nature. was held April 20 and on view until June 24, 2012. 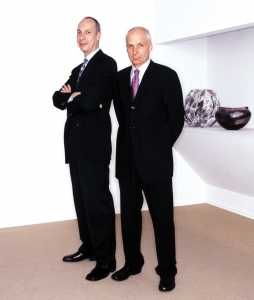 The preeminent international dealers in 20th century ceramics. They founded Garth Clark Gallery in Los Angeles in 1981 and opened a second space in New York, which they operated from 1983 to 2008. They now live in Santa Fe and work as private dealers. They have organized eight major international symposia on ceramic history and criticism, published numerous books and catalogs and received a number of prestigious awards, both lifetime achievement and honorary doctorates. Identical twin brothers, who work collaboratively on their narrative work exploring the topics of race, class and the working man at their studio in Centerville, Ohio. They both received BFA’s from Ball State University in Indiana and continued on to earn MFA degrees in Ceramics and Sculpture from the University of Kentucky. Kyle is Associate Professor of Art and head of the Ceramics area at the University of Dayton and Kelly is an Associate Professor of Art and head of the Sculpture area at Xavier University, both in Ohio. was exhibited from: April 16 – June 20, 2010. Editor of Ceramics Monthly and Co-Host of CeramicsArtsDaily.org. 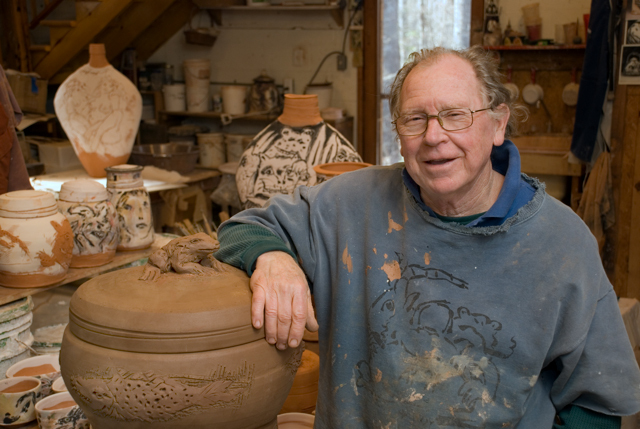 Hall majored in ceramics in college, graduating with a B.F.A. from Ohio State University in 1996. He ran an independent ceramic studio for several years before being hired as Assistant Editor at Ceramics Monthly, the world’s largest ceramic-art magazine, in 1999. Initially, he continued to run his studio as well, but eventually decided to close, since he was not able to devote the time needed. He chose instead to concentrate on supporting the field of studio ceramics from the other side of the studio door. In June 2003 he was promoted to be the editor of Ceramics Monthly.